The final part of this expat exploration admittedly is a bit of a downer. Then again, the title is "The Downsides". They are, from my vantage point, still far fewer in number than the upsides, so you can expect much more of latter in future posts. As far as foreign places go where a native English speaker can set up camp and get by in his/her own language, the Netherlands is head and shoulders above much of the world, and not just in a physical sense. The Dutch have the second-highest proficiency among non-native countries in terms of English skills. Still, the expat can occasionally wade into all kinds of difficulties. I experienced it just the other day, rather severely, where in my mostly decent Dutch I told the guy cutting my hair "Not too short please, just something nice for my upcoming wedding." I obviously got it wrong by a word or two though. Yikes. 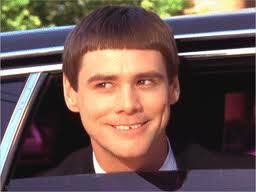 I looked like Jim Carrey in Dumb and Dumber. It's likely that there are variations of it in almost every country, whereby the locals enjoy a cheaper cost of living than do visitors. As they should. Still, here in Amsterdam at least, the difference feels acute. The red light district is not the only place where expats pay to get screwed. It's very likely that, in a given workplace, the expat will be paying 1250 EUR for an apartment that the local Dutch native will be paying 500 EUR for. This is because many Dutch are eligible for subsidized housing, entering the rental market at a very low rate and then keeping it out of the sights of regulators, who would prefer that as income rises, eligibility to receive subsidies wanes. This means expats, partly out of ignorance but mostly out of the years in waiting list time to receive this government goodie, pay often two to three times more in rent. Many landlords are aware of this, with ads saying "Expats Only". Schooling is also an issue, with foreign students paying many times more in fees than locals. This I can understand - the Dutch families that have been paying tax into the system since little Jip or Janneke was an embryo deserve to be paying less than the outsider who just arrived. Most countries do this, I believe, so no harm here, except to the wallet. Far and away the biggest problem with being an expat is the absence of good friends. Good old friends, I should say, because there are definitely some good new ones to be found. Still, I've noticed often over the past few years that new friendships lack the foundation that cements old friendships. With their anchors in shallow, sandy water here in Amsterdam, new friendships often drift down the canal at the sign of the first ripple or strong wind. They haven't had the time to develop the strong base that old friendships have, a base formed by years of laughs, tears, life in general. Too many times - and I am equally at fault - people just fade away here. A shared cultural background is also often missing abroad - it's not something I ever considered before I came, but not being able to reference a key Saturday Night Live clip or share a piece of lamentation pie over the demise of the Montreal Expos can sometimes be a sad thing, strangely enough. It doesn't get much easier. I regularly bike past any number of lively cafes and see a group of guys having a beer and a laugh together and I feel a real jolt of sadness. I once heard a saying along the lines of "you can't make new old friends". Corny, maybe, but spot-on. This was reinforced over the past week, with some great friends in town. With their recent return to Canada again, missing from these streets and pubs, the void is palpable. This one caught me off-guard. I anticipated culture shock upon first arriving, with different unspoken cultural norms, strange foods, and the mystifying ways of foreign women. Turns out that was all kind of a breeze (holla). For anything that one might think of as "strange", I was able to chalk it up to exciting newness and a new way of looking at things. But now, being no longer really a tourist and having immersed myself in the cultural fabric - a neighbourhood for more than 6 months, a job, the requisite government red tape - the shock has been like a time-release vitamin. In some cases, this has been a tough pill to swallow. Things begin to grate after a while, as they can no longer be considered just quirky or new. I've been scolded by a number of retailers or service people too many times - me, the customer, the one with the money and the option to take my business elsewhere. I've met mulish stubbornness combined with arrogance on a level I've never seen. My oft-documented hatred of shrieking Dutch children has not diminished. Bumbling or just plain poor service has not improved (seriously - how hard is it to hold the onions?). I won't say too much because A) I have met some great Dutch friends and colleagues and B) every country has its warts that can only be seen after a few years - but the shock effect is real. New posts coming this week - Sardinia, Holland, Expat Life and more! Ok, not more, but still!